The Rally to Restore Sanity and/or Fear: For the Young or the Young at Heart? 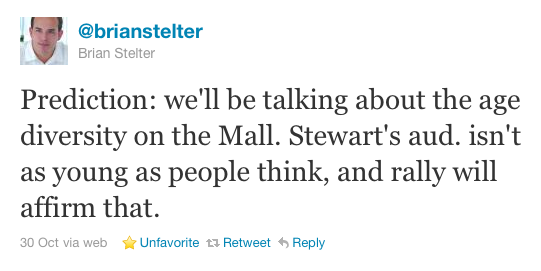 Stelter’s was the last tweet I read before my phone service shut down completely. A journalist for the NY Times, Stelter predicted that after the rally, the media would be buzzing about the age diversity on the Mall. But they didn’t. Rather, the anchors, journalists, and bloggers focused primarily on the signage, the unexpected turnout (215,000 vs. the predicted 60,000), and Jon Stewart’s stirring 12-minute speech/pep talk. And of course, one network covered the rally as an “insane” pot-fest, claiming erroneously that Proposition 19, a ballot initiative to legalize marijuana, was “one of the more common issues seen on signs.” Not true. While standing in the congested subway station, walking a mile to Mall, shimmying through the crowd, securing a spot near a JumboTron, and leaving the rally, I saw maybe four signs (out of hundreds) that alluded to Prop 19 or drugs. In any event, the huge audience and Stewart’s heartfelt attack on America’s “24-hour political pundit perpetual panic conflictinator” certainly warranted media coverage. But so did that which Stelter, other attendees, and I were noting both visually and virtually: that is, Gen-X and Baby Boomers were strongly represented in the crowd and onstage; and this, it seems, is something few people expected. 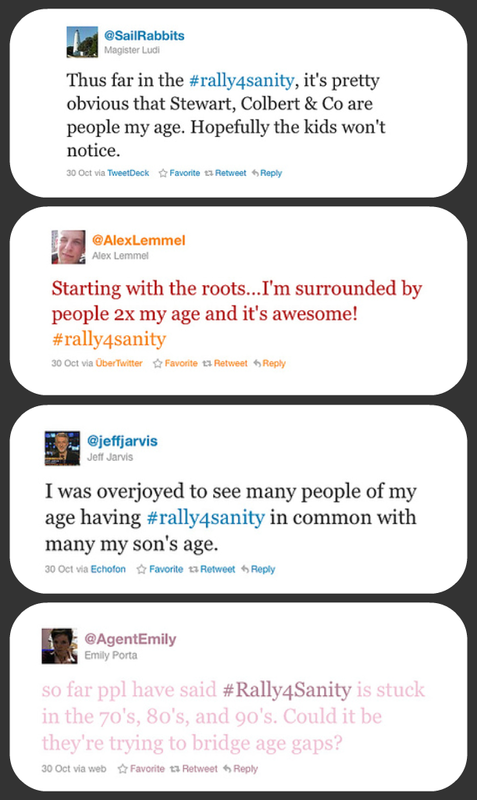 Live Twitter feed During the Rally. Again, from the moment I flew out of Detroit, I realized that the Rally to Restore Sanity and/or Fear would not be the so-called Millennial Woodstock I’d heard about for the week prior. 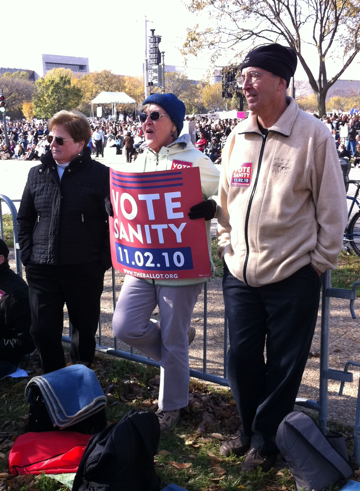 First, sitting in the window seat across from me was a Baby Boomer who proudly displayed his Rally to Restore Sanity hat. The following day, I stood shoulder to shoulder on a crowded subway with a couple in their late 60s who indicated their destination via t-shirts that read “I’m not afraid of Muslims, tea partiers, socialists, immigrants, gun owners, or gays. But I am scared of spiders.” Then, after stepping foot on the Mall and winding through the mob, I set up camp next to some Gen-Xers and several more Boomers, two of whom were initially “at the front near the stage” but relocated because they “were getting pushed back too much by the crowd.” But what really solidified this notion that the rally was conceptualized for the young and the young at heart was the program, chock full of performers and guests more familiar to people in their 40s, 50s, and 60s than the generation usually mentioned in succession with Jon Stewart and Stephen Colbert. My Baby Boomer “neighbors” enjoying the rally. 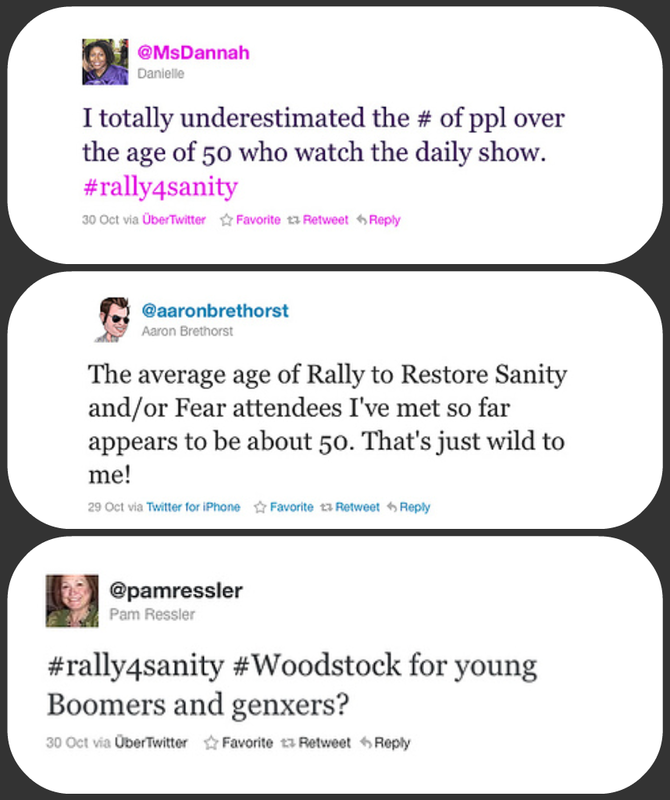 Specifically, the roster for the Rally to Restore Sanity and/or Fear (which was not released to the public beforehand) featured the following personalities/performers: The Roots, John Legend, Star Wars‘s R2-D2, Jeff Tweedy, Kid Rock, and Sheryl Crow — young(ish), hip, pop-culture icons with whom most Millennials are likely familiar.4 But also featured onstage that brisk fall afternoon (and arguably the most memorable) were Yusef Islam (formerly Cat Stevens), The O’Jays, Ozzy Osbourne, Father Guido Sarducci, Law & Order‘s Sam Waterson, Mythbusters‘s Adam Savage and Jamie Hyneman, Mavis Staples, Kareem Abdul-Jabbar, and Tony Bennett—names/artists more recognizable to Generation X and Baby Boomers than the supposed regular viewers of The Daily Show and The Colbert Report. 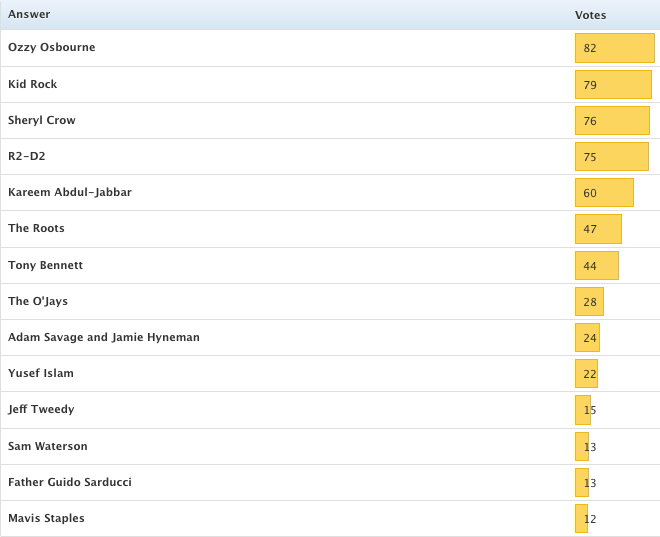 In fact, with the exception of The Prince of Darkness and Kareem Abdul-Jabbar, few of my students (I have about 200) could recognize the latter names (see poll below).5 Moreover, one student tweeted that even after he looked up some of the people, he still didn’t know who they were. In the same vein, a NY Times writer had to counsel his readers on Don Novello’s Saturday Night Live character who provided the rally’s “benediction”: “If you’re not familiar with the comedy of Father Guido, ask your parents. If they’re not familiar, have them ask your grandparents.” No, young person, just turn to the 40- or 50-year-old standing right next to you. As I’ve suggested above, audiences of The Daily Show and The Colbert Report are typically portrayed as liberal, lazy, pot-smoking college students — “stoned slackers,” Bill O’Reilly likes to say. Or as Rush Limbaugh put it a couple of days before the rally, they’re kids who are willing “to sit around, get drunk, smoke some doobies, and listen to putrid jokes told by a couple of half-baked comedians.”6 Furthermore, even when Stewart’s and Colbert’s viewers are represented positively in the media—for example, as being more in tune to election issues than non-TV-watchers and more “confident in their ability to understand the complicated world of politics“—the age-range covered is virtually always 18-25. But as the world now knows, Millennials are clearly not the only demographic that watches, embraces, and relishes in the smart satire of The Daily Show and The Colbert Report. Of course, those of us who’ve researched the two programs have been aware of this for years. For instance, we knew that in 2006, the average age of viewers was 35, their average income was $67,000, and they were 78% more likely than the average adult to have four or more years of college education. What’s more, we now know that the shows’ viewing age is steadily rising, for according to Nielsen ratings and a Forbes report, the median age of Stewart’s viewers is currently 41.4, and Colbert’s has risen from 33 to 38. I can only imagine that as the hosts and their audiences age, the figures will continue to increase. But so what? If the Rally to Restore Sanity and/or Fear is any indication of what that future will look like, why that’s not bad at all. Thoughtful piece, Kelly. I wonder how significant it is to consider overtly what seems to come through latently here. Although this isn’t necessarily your project in this article, how much of the explanation for an older crowd at Rally to Restore Sanity is due to economics? 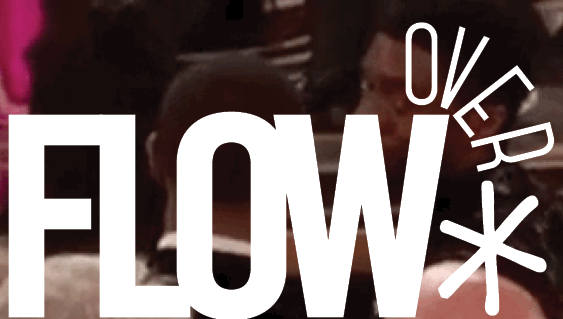 Is it possible that those who showed up in D.C. were simply those who could afford to? Just a hunch, but I’m wondering if these older attendees had better means to get off work, pay for travel, and generally spend the time and energy to stand on the mall for a day? This of course doesn’t speak to the research done on the actual viewing demographics of Daily Show and Colbert, and it doesn’t offer clarity on who the event was INTENDED for, but I’m curious as to whether you think it would be, at the very least, an explanation for who showed up? Apologies for misspelling your name, Kelli. Hi, Sarah! Sorry it took me so long to respond. Actually, that’s interesting because I did watch a bit of the televised coverage and I don’t remember thinking the visible demographic was remarkable in any way. 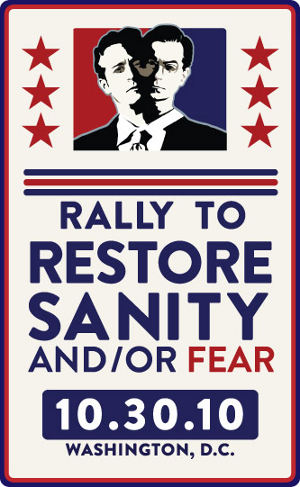 But now that I’m really considering how the event was formally covered, I seem to recall mostly wide and CU shots of the stage, aerial shots of the mall, or scattered medium shots of individuals holding signs or cheering. Not a lot of evidence, but definitely aligns with what you’re saying about the heavy coverage in the front. 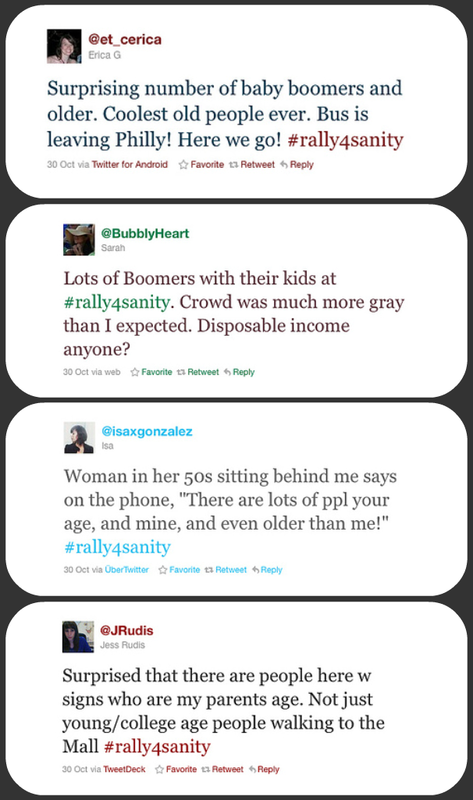 (And brings up questions of how the rally’s narrative was constructed for at-home viewers…) The way they chose to capture the event may very well have something to do with why press outlets covering from afar failed to notice the great deal of Boomers/Gen-Xers physically present. My 12 yr old son, his 46 yr old dad and his 82 yr old grandfather attended together. They were charmed by the “old folks” and embraced by the teens/ college-aged attendees. TV viewers saw a much limited perspective, usually framed in ways that “hippies and pranksters” would readily recognize– a much different description than the experience of the participants. A much different experience indeed. Thanks for the comment, Barbara! I enjoyed this piece a lot, and it got me thinking about several things. First, I agree with the first commenter, that there is almost certainly a link between the age and disposable income of the attendees. Not only that, but work practices tend to vary by age: Boomers are well into retirement age, and more than disposable income, many have disposable time. Many Gen-Xers, meanwhile, have advanced to positions of management or stable employment where they can afford to take vacation from their jobs to attend an event like this. Many 20-somethings are at the bottom of the corporate ladder, or working multiple part-time jobs that keep them employed 7 days a week, without the flexibility to take vacation. These arguments are based entirely on anecdotal evidence from my own experience, but I imagine it’s a factor–and it’s not meant to indicate that all people in their 30s-60s have achieved stable employment. I also wonder about the generational shift away from appointments. Both personal appointments and “appointment television” have changed as mobile devices have moved us away from punctuality (you can tune in and warn someone you’re running late whenever you want) and technologies like TiVo and websites like Hulu, not to mention torrent sites, make TV available at whatever time we want it. * What’s more, the increased mediation of experience–how much of our daily lives is spent with screens? how much information do we acquire through a media source?–may affect the willingness of younger people to show up to a live event. As convenient living becomes the norm, it’s possible that young people are less willing to go to the expense (both in time and dollars) necessary to bring their bodies to an event they can catch anytime they want. I speak as a young person (I am a 26 year-old media studies grad student), and I do not intend this as a value judgment, nor to indicate that my generation is lazy, or apathetic. But I do think that the understanding of what it means to be “engaged” has changed. Much of our generation’s activism occurs online through media channels; most of our information consumption does. The general failure of rallies and marches in our lifetimes–think Iraq invasion–alongside the general success of Internet activism–think MoveOn and the Obama campaign–may contribute to the decreasing investment in “live” political activism. It’s possible that what’s happening in the Middle East, not to mention across this country in union struggles, may change this, as live bodies in the street combine with social networks to cause a regional revolution. Maybe this will return to people my age a sense of the importance of physical presence in politics. Maybe not. Either way, it’s nice to see generations coming together, even if the generations are primarily the X and the Boom. *These methods of watching are also harder to account for in measurements of TV demographics, and I wonder if that skews the numbers here? this sort of space . Exploring in Yahoo I eventually stumbled upon this website.